It’s great to be back excavating at HeG, and great to be back teaching at the AERA fieldschool. Teaching in this fieldschool is a pretty special experience for me – the students are always so incredibly keen and interested, serious about learning but always there’s a good mix of site banter and laughter. 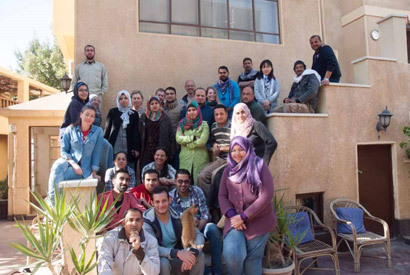 And this season is no exception, I am teaching fieldschool Unit 1 (FS1), with my colleague Rabee Eissa Mohammed. 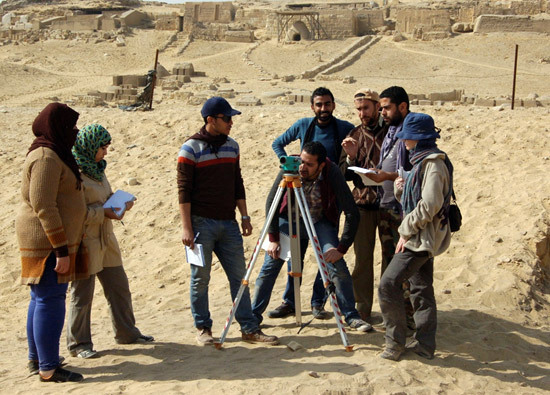 We have five great students (Aly Ahmed Aly, Hanaa Hagag Sayed, Kholoud Abd el- Naby, Mohammed Abd el-Maqsoud, Rahel Glanzmann) and two trainees (Ibrahim Samir Ibrahim and Mohamed Arafa), and are joined by archaeologist Virag Pabeschitz. Rabee Eissa Mohamed teaching the FS1 students and trainees how to use the Auto Level. We’re only a week into the fieldschool, but already the students have learnt and experienced the importance of cleaning the site thoroughly, identifying different deposits by their composition, colour, and types of inclusions; co-ordinate systems and our own 5m grid; planning archaeological features at scale 1:20; setting up and using the Auto Level – and loads more. It’s the first week on site, and the AERA team is excited to be back at Standing Wall Island (SWI). 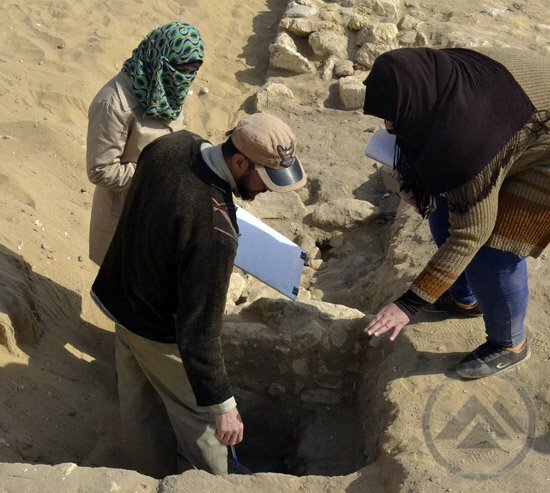 This year, a team of Egyptian students will be working in the Eastern part of this intriguing area, and trying to understand how this enigmatic island of archaeology fits in with the houses, streets and galleries that make up the rest of the site. Unusually, this large, walled enclosure features rounded corners – elements that point towards the management of animals. Previous work by our animal bone expert Dr. Richard Redding, has suggested that the area may have functioned as a cattle corral, and this exciting possibility means that SWI may help us to understand how Heit el-Ghurab was provisioned with meat – an important food resource for which we find abundant evidence. 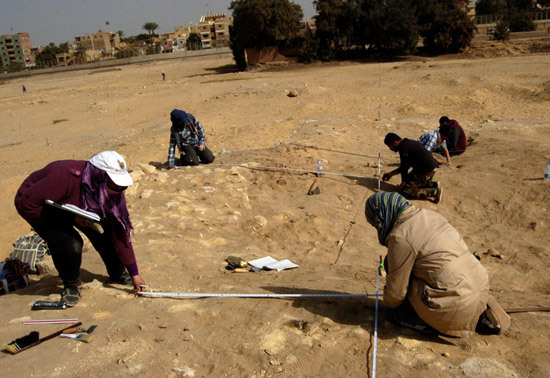 This year, we will test this theory by carefully targeting excavations to look for evidence that might point towards the area having been used as a stock enclosure. view to the North. Photo by Kirk Roberts. 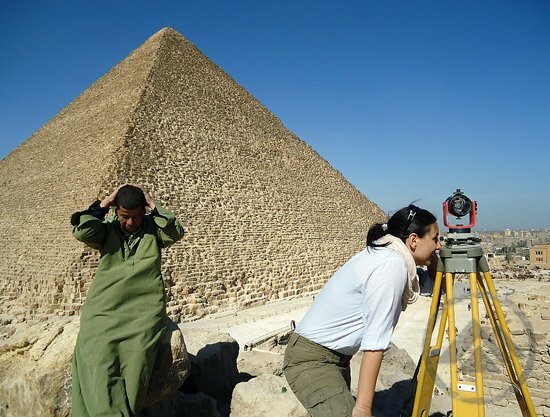 Working in Egypt a stone’s throw from the pyramids? This is a real archaeologist heaven! The team so far. Photo by Yasser Mahmoud. 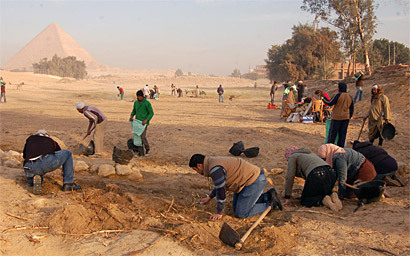 We have busy days which start early in the morning, but it’s never too early to start your day in Giza to excavate in one of the most important archaeological sites. Have you ever seen the pyramids early in the morning without tourist? Truly amazing. It is very heart-warming to see the field school students as they gather around their teacher and soak up the new knowledge in the field and after they put it into practice. I think they will be very successful and professional archaeologists. Survey class on site. Photo by Virag Pabeschitz. The AERA 2015 Field Season Begins! 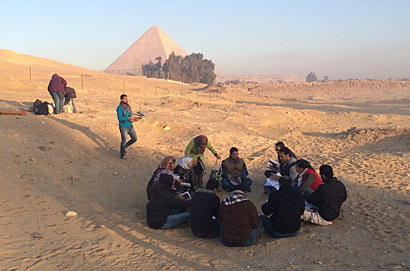 Gradually the team assembles at Giza for the 2015 excavation season. For most of us, this involves travelling south – away from cold weather, storms and snow. 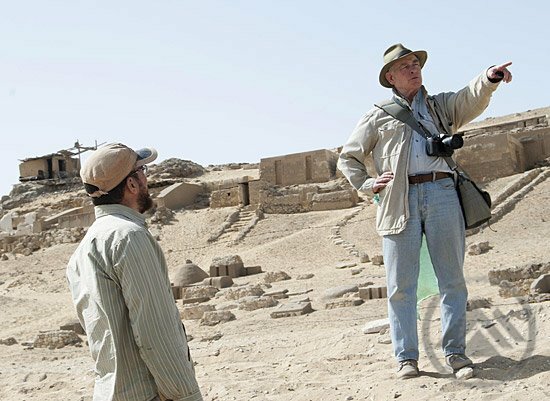 It is wonderful to be back in the warmth of the Giza plateau. We have been preparing for the season for weeks; assembling equipment, organizing documentation, surveying the excavation grid, cleaning the site from vegetation, and removing the protective layer of sand (backfill) which protects the mud brick ruins in between excavation seasons. We also prepared manuals, lectures and equipment for the field-school students. Field-schools are an important component of AERA’s fieldwork and this year we celebrate the 10th anniversary of the AERA/ARCE field-school. We would like to assemble alumnae from all over Egypt and celebrate with a party towards the end of the season! Surveying the excavation grid. Virag sets up the reflector helped by Shaltout. Photo by Kirk Roberts. 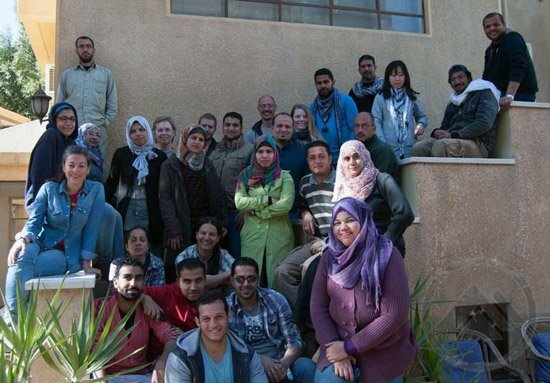 We reached the end of the 2014 Mit Rahina field-school. ‘All too short’, is the unanimous feeling of the team. But we have managed to do a lot in only 4 weeks. 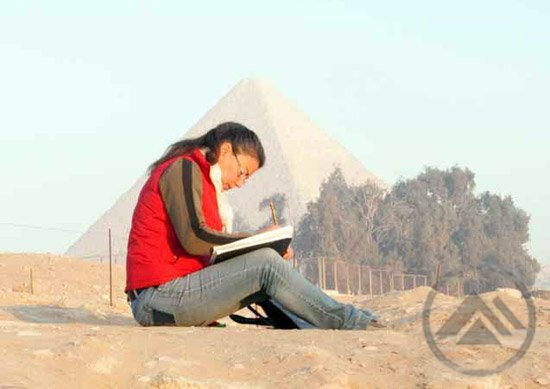 Our aims were to train students in advanced ceramics analysis and archaeological illustration; and analyse certain categories of material – Old Kingdom ceramics, objects, mud sealings and ground stones. Every morning we left the Giza Archaeological Centre soon after 6am, to drive to Memphis where we arrived to see the sun rise over the palm groves. We worked there until 1pm with a short break for breakfast at 10am. September-October is date harvest time at Memphis so often we had trays of different types of dates brought to us for tasting. Some prefer the bright yellow fibrous dates, others the dark brown soft dates, dripping with ’honey’. All washed down with strong tea made over a wood fire. 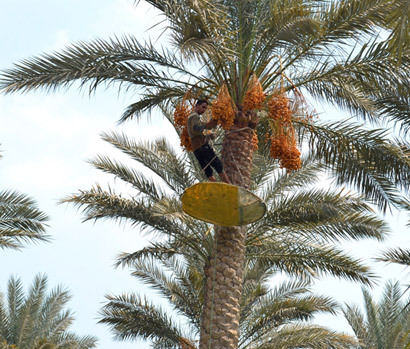 Simple tools for the date harvest – a belt to serve as a climbing harness, bare feet, a sharp knife, and a wide and shallow basket. Photo by Sayed Salah. Our supervisors in the ceramics team gave us some topics to read and discuss together the following day. They also assigned pages or topics for every one of us. One day they gave us some pages with a lot of topics, and they asked us to divide it between ourselves. But we didn’t know how to do that! If we divided it by pages the topics would not be complete, and if we divided it by topic some of us would have more than 5 pages and the others less than half page. So what could we do? The ceramics group at work in the Mit Rahina courtyard. 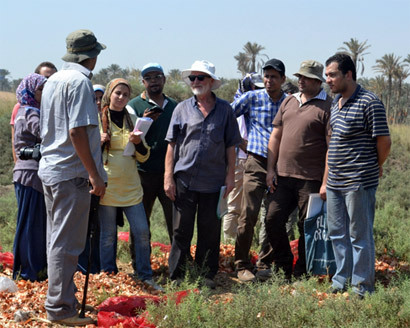 Left to right: Rehab Mahmoud, Walid Abd el-Bary, Sherif Abdel Moneim (supervisor), Rudeina Bayoumi and Aisha Mohamed Montaser. When I spoke for the first time with Ana Tavares about the food production research project I am currently carrying out in several regions of North Africa* and, in particular, about the analysis I am doing on grinding stones, she experienced a ‘light bulb moment’ and, smiling, exclaimed: “I have finally found somebody who may be interested in our fantastic querns and grinders! 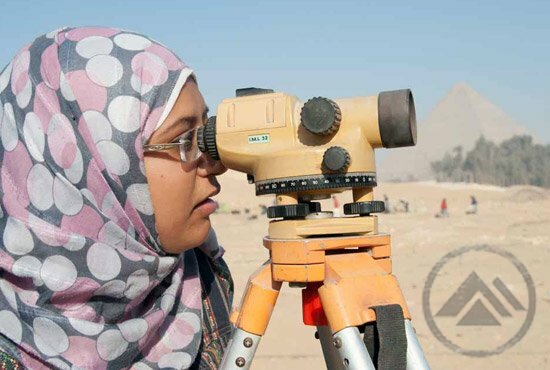 Do you think we can apply the same approach to the tools coming from the ancient capital of Egypt?” She did not have to wait too long for my reply. I was absolutely delighted and honored by receiving this proposal, especially considering that the importance of stone assemblages coming from dynastic contexts is very often underestimated or, at least, not considered at the same level of other classes of materials, such as pottery. As an archaeologist and prehistorian I have to admit that making the stones ‘speak’ has always been my greatest passion and the possibility to analyze assemblages from such an important Middle Kingdom site is a new challenge for me. This is the reason why I am writing this blog today. 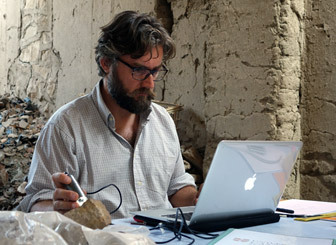 Giulio analyzes a grinding stone, from Middle Kingdom Memphis, with a USB microscope. As usual, we wake up at 5:45 am to prepare ourselves for another working day. After breakfast and tea we got in the microbus on our way to the stores room at Mit-Rahina (Memphis). 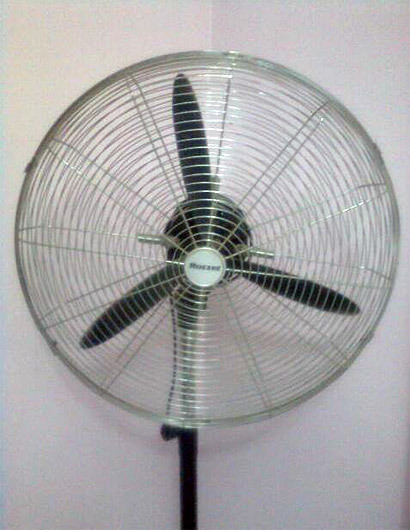 But this day is not like any other day because there was a special gust with us in the microbus in the form of a big fan. This fan was to provide us with cool air during our work in the store room. But sometimes things never go according to plan. When we arrived at the store room the electricity was not working. At first we thought it would be off for only one or two hours, but it seems that the electricity did not like our new guest, the fan; because it stayed off the whole working day. At 11:30 am there was a surprise. 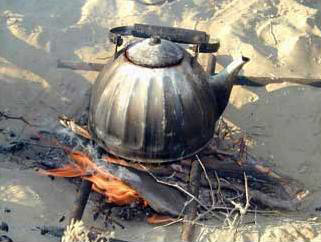 Very Egyptian cups of tea were made not by the modern way, but in the ancient Egyptian way using a Hearth. 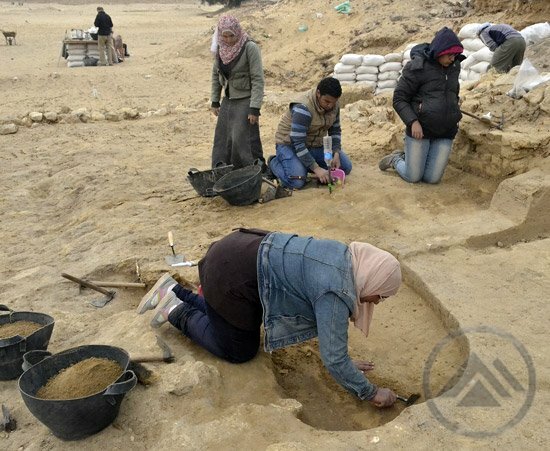 Everything is coming along very nicely with this advanced Mit Rahina field school, with an enthusiastic and highly committed group of students and their typically professional, critical but supportive tutors. Everyone seems content with their specialist subject areas (ceramics and illustration), and each gave a short and lucid presentation to the others just before the weekend. The tutors are also following their specialisms such as the sizeable collection of seals and seal impressions from the Kom Fakhry site. My job, as last time three years ago, is to introduce the students to the site of Memphis and the challenges it faces. 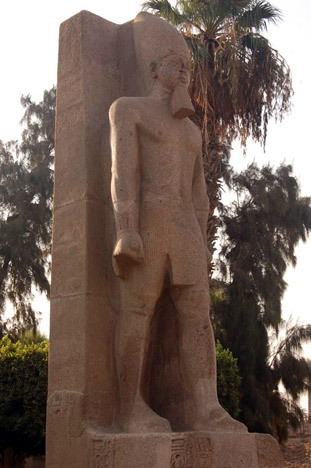 I will be giving short illustrated talks on the background to the history, and the history of exploration, of Memphis, and we have started a series of site tours, beginning with the Mit Rahina museum with its showpiece, the colossal limestone statue of Ramesses II (Abu’l Hol) and the various objects inside and in the museum garden, including the two standing restored / rebuilt colossi in granite, partners to the limestone one. As the geographic information specialist (GIS) at AERA, my job is to digitally archive, synthesize and present our excavation data in ways that make it more understandable and usable to other people – both to our own researchers and, through articles and illustrations, to other people who may have never seen our sites before. Working with the Mit Rahina site data from Memphis is a bit different than working with our Giza data. While I know the Giza sites backwards and forwards, I’ve never seen the Mit Rahina site in person. In some ways this makes my job harder, as I have to orient myself solely through our excavation archive. In other ways though, this helps me to do my job better, as I can’t take anything for granted and I know that if something doesn’t make sense to me, it probably won’t make sense to outside researchers either. I feel like I am the canary in the coal mine for data clarity this year!